On a previous visit to Brighton I was unable to find a pub of the kind that I like in the part of the Lanes area nearest the seafront. Everything seemed quite chainy and depressing around there, so this time - on Sunday 8th August - I ventured into the so-called 'North Lanes' area, which is a bit more grubby and down-to-earth. 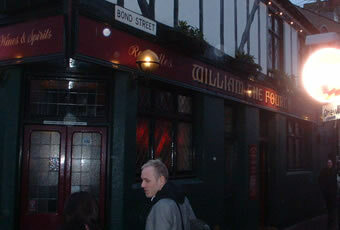 I soon stumbled on this attractive-looking, maroon-painted pub on a corner and decided to give it a try. I liked the old-fashioned, but well-kept '70s style interior, and found the barman very courteous. Beer-wise, I opted for the Midhurst mild, which was good. Harveys sussex best bitter , spitfire , and more unusually ballard's brewery mildhurst mild. only one of 2 pubs to be selling to be selling , mild , the other being the e.s . nice interior again . very knowledgable , enthusiastic barman . Fortunately all the 97 year olds seem to have moved on now (?). The pub wasn't too busy considering it was a Saturday afternoon, St Patrick's day, and the last day of the 6 Nations. So it was easy to get a seat - even in the non-smoking are at the back. The Harvey's Best was OK but I've had better. Unlike other pubs we visited in Brighton there didn't really seem to be much of an atmosphere just a few tables of people sitting about. But I have no real complaints about the pub, but there are better pubs in Brighton. Pleasant enough pub in good location although average age of clientele in here was about 97 (that is the woman I am going to marry) on a thursday late morning/lunchtime but that's better than psychotic 17 year olds. Decent beer. Real fire in the winter. But yes, a traditional pub stylee.